In The Case for Make Believe, Harvard child psychologist Susan Linn tells the alarming story of childhood under siege in a commercialized and technology-saturated world. Although play is essential to human development and children are born with an innate capacity for make believe, Linn argues that, in modern-day America, nurturing creative play is not only countercultural—it threatens corporate profits. A book with immediate relevance for parents and educators alike, The Case for Make Believe helps readers understand how crucial child’s play is—and what parents and educators can do to protect it. At the heart of the book are stories of children at home, in school, and at a therapist’s office playing about real-life issues from entering kindergarten to a sibling’s death, expressing feelings they can’t express directly, and making meaning of an often confusing world. 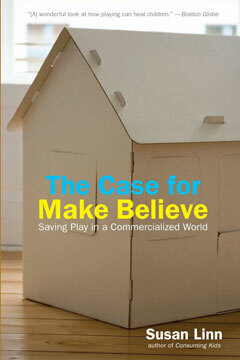 In an era when toys come from television and media companies sell videos as brain-builders for babies, Linn lays out the inextricable links between play, creativity, and health, showing us how and why to preserve the space for make believe that children need to lead fulfilling and meaningful lives.